how to trigger advocacy on legislation. Throughout, particular attention is paid to the ongoing work of the International Competition Network (ICN), the European Cooperation Network (ECN), and the Brazilian Administrative Council for Economic Defence (CADE). Relying on an effects-based approach, these essays seek to foster international cooperation and facilitate effective international cooperation to the benefit of member agencies, consumers, and economies worldwide. Underlining the important thesis that international cooperation is a key element for convergence and for the future success of competition law enforcement, the book take a giant step towards demonstrating how the anti-cartel struggle can be supported and facilitated, and how fair cooperation in multijurisdictional mergers can be achieved. Practitioners, policymakers, and officials dedicated to the enhancement of competition laws worldwide will turn to this volume for years to come. Preface: A Move Forward on International Cooperation Alexander Italianer. Foreword: On the Way to More Cooperation Andreas Mundt. Foreword: International Cooperation: A Multifaceted Reality Bruno Lassere. 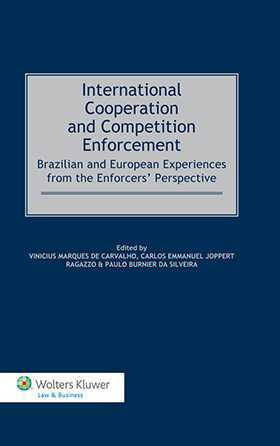 Foreword: Presentation: International Cooperation at a Glance Vinicius Marques de Carvalho & Carlos Emmanuel Joppert Ragazzo. Chapter 1 Keep Calm and Carry On: Institutional Reform and International Cooperation in the United Kingdom Andrew Pickering. Chapter 2 Competition Policy and the Role of the Chief Economist’s Office: The Use of Economic Evidence, the International Practices, and the Brazilian Experience Camila Pires-Alves & Tainá Leandro. Chapter 3 Regional Cooperation in Antitrust Enforcement: The European Competition Network and the Main Pillars on Which It Is Built Ewoud Sakkers . Chapter 4 Developments in and around the European Competition Network and Cooperation in Competition Enforcement in the EU: An Update Ingrid Breit, Jeroen Capiau, Dorothe Dalheimer, Vita Jukneviciute, Petra Krenz, Evelyne Rikkers & Ailsa Sinclair. Chapter 5 International Cooperation in the Field of Competition Enforcement: Overview of the Polish Office of Competition and Consumer Protection’s Experience Marta Skrobisz. Chapter 6 Competition Law and Policy in Austria: The Merits of International Cooperation for Young Competition Agencies at the Example of Austria Natalie Harsdorf & Barbara Seelos. Chapter 7 Fighting Corruption and Promoting Competition in Brazil N itish Monebhurrun. Chapter 8 The Working Group on Trade and Competition Policies (WGTC) in Latin America and the Caribbean: Fostering Cooperation and Regional Integration of Markets Pierre M. Horna. Chapter 9 Merger Notification Policies towards Minority Shareholdings Eduardo Frade Rodrigues. Chapter 10 Brazilian Recent Experience on Cross-Border Merger Remedies Virgínia de Melo Dantas & Julia Mendes de Carvalho. Chapter 11 Transactions at the Fringe: A Discussion about the Scope of Merger Control Review in Brazil Ticiana Nogueira da Cruz Lima. Chapter 12 The Judicial Analysis of Cade’s Decisions Convicting the Companies Xerox and White Martins for Abuse of Dominant Position Gilvandro Vasconcelos Coelho de Araujo. Chapter 13 Protection of Confidentiality of Leniency Applications before Judiciary Mirta Kapural. Chapter 14 International Cartels in Brazil: An Overview and a Look Forward Paulo Burnier da Silveira & Priscilla Tardelli Tollini. Chapter 15 The Use of International Experience in Anticompetitive Unilateral Conduct Investigations in Brazil: The SKF’s Resale Price Maintenance Debate Ricardo Medeiros de Castro. Chapter 16 Antitrust Enforcement in the Brazilian Financial Sector: The Principles of Competitive Neutrality Applied to State Commercial Banks Ana Carolina Lopes de Carvalho. Chapter 17 License to (Co)operate: Proactive and Differentiated Competition Enforcement in the Dutch Health Care Sector Tineke Serlie-Stolze .